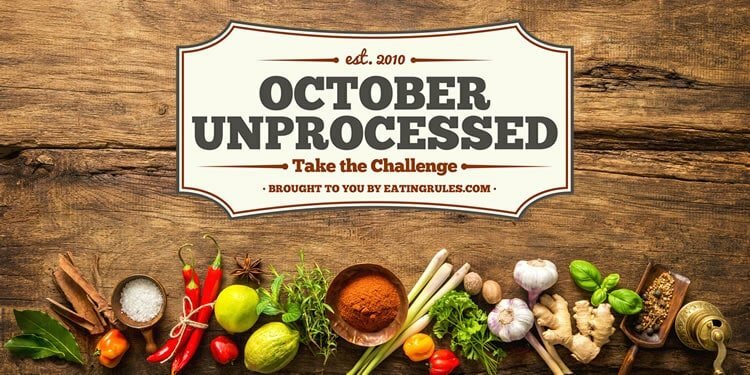 Nearly a thousand people have now taken the October Unprocessed challenge! If you haven’t taken the pledge yet, please do it today. (If you already eat this way all the time, take the pledge and show your support! And if you think it’s too daunting, how about just for two weeks? Or even a day? Do what you can, and take charge of your health!) … We’ve got a lot of momentum, and this is turning into something really powerful. Keep it up–and bring your friends! Another of the most commonly asked questions about October Unprocessed and the Kitchen Test is, you guessed it: Chocolate. 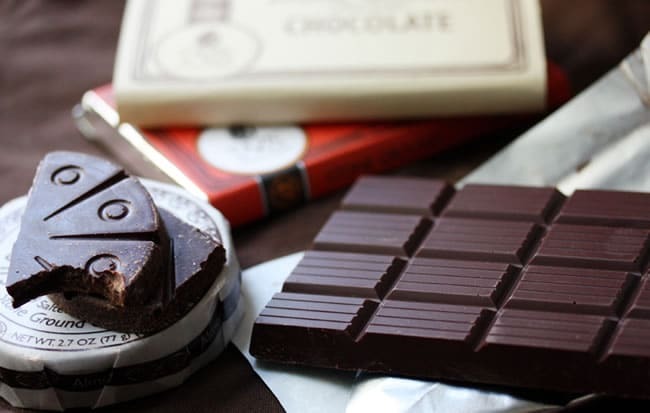 There are a ton of different types of chocolate products, of course, and it can be tough (or at least tedious) to figure out which store-bought versions actually pass the kitchen test. In theory, at least, chocolate is one of those unprocessed foods that easily passes the test. If you knew what you were doing, you could grow cacao, harvest and ferment the beans, dry them, roast them, crack them into nibs, grind them into liquor, conch the liquor (mixing it for several hours), temper it, and then add some sugar and form it into a fabulous home-made chocolate bar. Here’s a great, thorough walk-through of how chocolate gets from farm to you. It would probably take you two or three weeks to get through all of those steps, but again, you could do it if you really wanted to. If you are a brave soul who has actually done any of this, please tell us about it in the comments! If you’d like a shortcut to fantastic homemade chocolate (starting from cocoa powder), don’t miss Desiree’s guest post on how to make chocolate. Cocoa Powder is the non-fat component of chocolate (the fatty component is called cocoa butter). Sometimes listed as cocoa solids, it may also be called cacao or just cocoa. On its own it passes the kitchen test easily. This is also the part of the cocoa that has the most minerals and flavonoids. In other words, it may very well be the healthiest part of the chocolate. However, if you come across “Cocoa processed with Alkali” or “Dutch-Processed Cocoa” (same thing), that means that they’ve added an alkali (a base) to the chocolate to counteract some of the acidity. From a health standpoint, you’re better off finding cocoa powder that has not been processed with alkali — because that processing destroys most of the beneficial flavonoids. It’s tricky to actually find exactly which alkali has been used to process the cocoa, since it’s not usually listed in the ingredients. Potassium bicarbonate seems to be the most common. Personally, I’m going to avoid any cocoa powder that has been alkalized. Not a lot of actual chocolate in this “milk chocolate” bar. Most store-bought chocolate bars contain emulsifiers, flavorings, or other additives that you wouldn’t or couldn’t use if you were to make it at home. Lecithin (usually soy lecithin) seems to be the most common commercial additive. It’s an emulsifier that helps keep the cocoa and the cocoa butter from separating, which helps keep it looking good, even after it’s been sitting on the store shelf for a while. While lecithin may or may not be “good” for you (I don’t think it’s been studied enough, and it’s certainly not necessary in our diets), you certainly wouldn’t make it at home: To make soy lecithin, it’s extracted from soybeans using hexane. Almost all chocolate bars contain sugar in some form or another — otherwise it would be too bitter to enjoy. (You can find 99% chocolate bars which are used for baking, not snacking). We’ll need to apply the kitchen test on the specific type of sugar they use (some just list “sugar,” others will be more specific). Other chocolate candies may, of course, add flavorings or preservatives other things that probably don’t pass the kitchen test. For those, you’ll need to read the ingredients list and apply the test to each one. As a general guide, the larger the company, the less likely the chocolate bars will pass muster (he said, staring towards Pennsylvania). However, there are some commercially available chocolate bars that pass the test, and in my experience, the darker the bar (82% or 85%! ), the more likely it is to pass. In the years since we started October Unprocessed, more and more companies that focus on fair trade and social/environmental justice have appeared, and they’re more likely to skip the additives — and thankfully we can find them much more easily than before (Careful, though: the major brands have caught on. For example, The Hershey Company bought Dagoba in 2006.) Some brands I like: Theo, Alter Eco, Equal Exchange, Taza, Gnosis. Here’s also a thorough blog post that lists bars they’ve found without soy products (those may still use other taboo ingredients, but it’s a good place to start looking), and you might also want to check out the Food Empowerment Project’s slavery-free chocolate list. If you know of more chocolate bars that pass the kitchen test, please share in the comments. White chocolate is a candy that’s made with sugar, milk, and cocoa butter. There are no cocoa solids (cocoa powder) at all. This may pass the kitchen test, depending on the specific ingredients and where you draw the line for yourself. But just remember that the beneficial parts of chocolate are found in the cocoa solids, so don’t think that you’re getting any health benefit from white chocolate. Milk Chocolate is a solid chocolate that’s been made with “milk.” I put that in quotes, because it may be milk powder, liquid milk, or condensed milk. These types of chocolates usually have a lot of sugar — in the United States, they’re only required to have a minimum of 10% of chocolate liquor (European states are a bit higher, in the 20-25% range). My read on most store-bought milk chocolate is that it’s probably not going to pass the kitchen test. 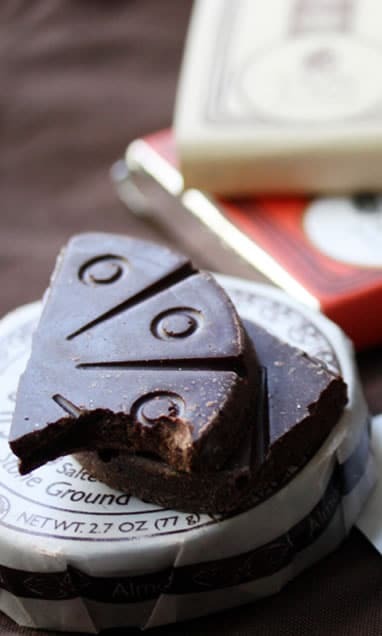 “Raw” Chocolate is one that hasn’t been processed or heated to the same degree as “typical” chocolate (details on “raw” tend to be a bit sketchy, and vary with each company). 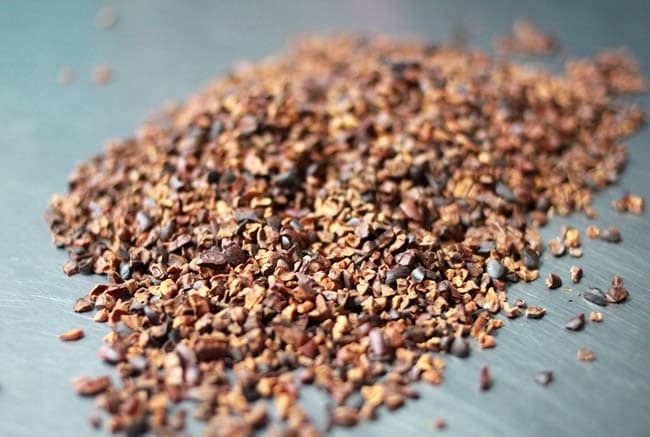 Cacao Nibs (Cocoa Nibs) are the dried beans, usually broken into little pieces, and are sold either before or after roasting (much like any other seed or nut). I think that about covers it for chocolate — did I miss anything? Do you have any recommendations of store-bought chocolate that pass the kitchen test? Unwrapped Taza Chocolate © 2009 Emilie Hardman, used under creative commons license. 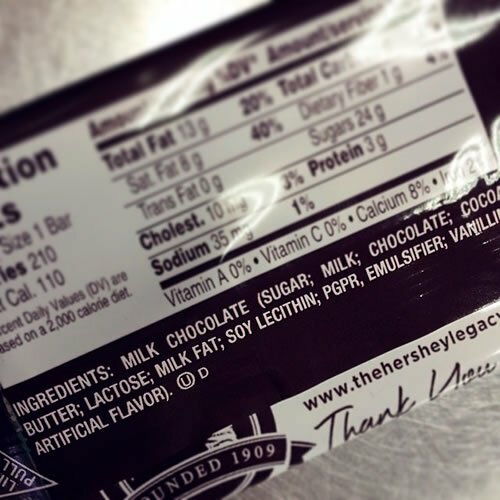 Hershey’s Milk Chocolate Wrapper © 2014 Andrew Wilder, shared under creative commons license. Cacao Nibs After De-Chaffing © 2012 Daniel Brock, used under creative commons license. *chocolate sauce – same as above but sub greek yogurt or avocado with coconut oil. If you put this over ice cream, it hardens like magic shell. *chocolate “ice cream” – frozen bananas and cocoa powder blended in food processor until smooth. Sometimes I add peanut butter or frozen berries/cherries. Nice post, Andrew – I second the motion on Theo Chocolate – They are one of the few “bean to bar” factories in the country, plus they are organic and fair trade. A fun fact I learned while researching chocolate: Chocolate has to have at least 10 percent cacao to be labeled “chocolate.” So if you see (chocolate) chips at the store that are labeled “baking morsels” it means that there’s less than 10 percent cacao in them and they couldn’t quite muster the “chocolate” label. I make a chocolate paste (like a very thick frosting) by mixing raw cacao powder and date syrup. This makes a no-fat very rich chocolate treat. Texture variations (these add fat): add a little raw nut butter and ground flax to make a truffle. Flavor with almond extract. Roll truffle balls in cacao powder, sesame seeds or coconut. Yummm mberkovitz! Thank you for the recipes! Lecitin as a food supplement is used to treat plugged milk ducts in breastfeeding women. I have always considered it a not-harmful (not to say beneficial) ingredient in food although I never gave a thought to how it is extracted – Hexane is a known carcinogenic and I read (on Wikipedia) that traces of it remain in the food.